If you want to get to know more about Python, then be aware that a Python certification course is now included in the many online IT certification courses offered by Brainmeasures. The Python course from Brainmeasures is extremely useful in your attempt to become more proficient and versatile when it comes to using the Python programming language. With the help of this online certification course, you will become more familiar about all the features installed in Python, its benefits and the many techniques that you can use and adapt to meet all your programming needs and requirements. This program from Brainmeasures guarantees that you will get a more comprehensive Python training which covers all the vital elements of the programming language and the procedures involved in using it as a system utility and in component integration, internet scripting, rapid prototyping and database programming. 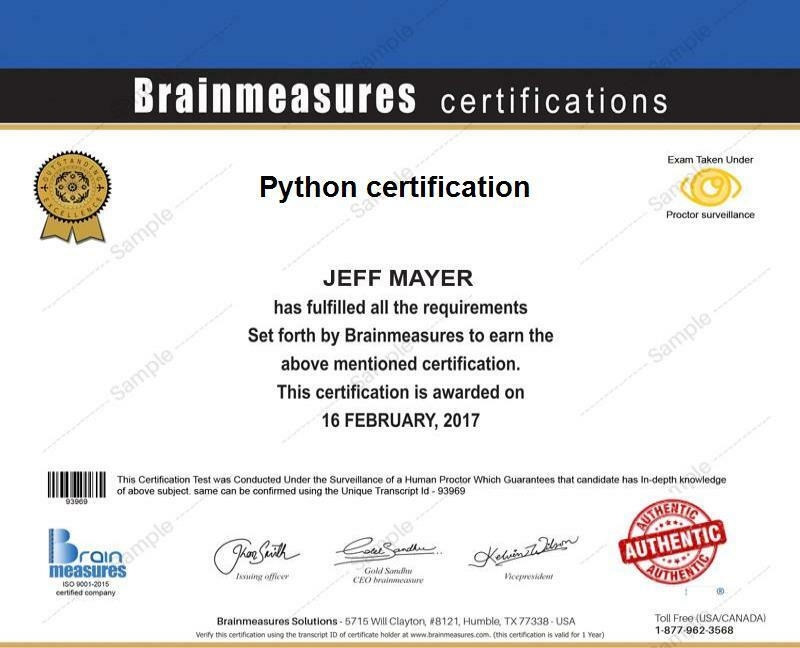 Receiving your Python certificate from Brainmeasures is a huge help in significantly boosting your confidence since you know that the knowledge that you received from the Python certification course will allow you to compete with other Python experts in the IT industry. The easy accessibility of the Brainmeasures Python certification course at present is extremely beneficial for those who are working in the IT industry specifically individuals and professionals who are into programming. This is suitable for IT professionals, web programmers and developers and any other individuals and professionals who want to gather more information about the basics of writing programs with the help of Python programming language and understand all the features of Python, its strengths and weaknesses and all the advanced concepts and strategies present in its libraries. Working in the IT and web programming industry after finishing your Python certification course is a huge help in dramatically increasing the level of your salary. As a Python certification holder, you get the chance to access profitable positions in the IT industry and most of these positions allow you to earn around $75,000 to $119,000 per year. If you want to work as a Python developer or programmer on an hourly basis, then you can charge your clients around $24 to $150 per hour depending on your location, level of your experience and the extensiveness of the specific project that you need to complete.